Cape Coral sits on Florida’s stunning Gulf Coast, and the fun-to-say Caloosahatchee River runs here. But that’s not all—oh no. There are more than 400 miles of canals here, making it the city with the most miles of navigable waterways in the world. “Snowbirds” are Northerners who head down to Florida to escape their unbearably frigid winters, just like migrating birds. One in five people of Cape Coral only live here seasonally. It probably has something to do with the fact that average highs hit the upper 70s to lower 80s November through March, with average lows staying in the mid 50s to low 60s. The city has the largest population of burrowing owls in Florida, with about 1,000 nesting pairs. They’re one of the smallest owl species, averaging an adorable 5 to 8.5 ounces and 7 to 11.5 inches tall. In celebration, the Cape Coral Friends of Wildlife has been hosting the Annual Burrowing Owl Festival for well over a decade. Sun Splash Family Waterpark is a massive recreation center with all sorts of wet fun, including pools, splash pads, water slides, tube rides, flume rides and more. There’s stuff for kids of all ages, and for adults who want to act like kids. And so much more to enjoy this great city: Cultural Park Theater, Four Mile Cove Ecological Preserve, the biggest Oktoberfest celebrations in the state, environmental classes hosted by Rotary Park Environmental Center, the Academy of Model Aeronautics and the Cape Coral R/Sea Hawks Club where your radio controlled toys can fly as well as the honoring those who served with the Southwest Florida Military Museum and Library offering 34,000 square feet of military history. Not to forget about all of the luscious green golf courses, amazing spots to indulge as “foodies,” culture and history too much to fathom…come experience this amazing city! A balanced real estate market is where both the supply and demand for homes and condos in a particular area is roughly equal. In a balanced real estate market there is about a six month supply of homes on the market. A balanced real estate market is not something that usually happens for a long period of time in Florida. But that’s okay really, it’s usually just a threshold that is passed as Florida is transitioning from a buyer’s market to a seller’s market or vice-versa. The odds are that you will not likely move to Florida when it’s a balanced market. A buyers market in Florida happens when there are more people who what to sell (often to leave the state) than there are people who want to buy. During a buyer’s market in Florida there will be more than a six month supply of homes for sale. This means there will usually be a lot of homes to chose from in your price range. Because the supply of homes exceeds the demand for them in a Florida buyer’s market, buyers can take their time when shopping for a home because homes will sit on the market for many months, possibly a year or longer without selling. Buyers may not want to be too eager to make an offer because sellers will often reduce their prices. Even if they don’t drop the price, more sellers are willing to entertain low offers because they have no idea how long it may be until the next offer comes along, if at all. And that offer may even be lower. In a strong buyers market, you will notice more for sale signs appearing on more homes every week. Those new listings may also be priced lower than existing for-sale homes in the area thereby pressuring those older sellers to reduce their price in order to compete. 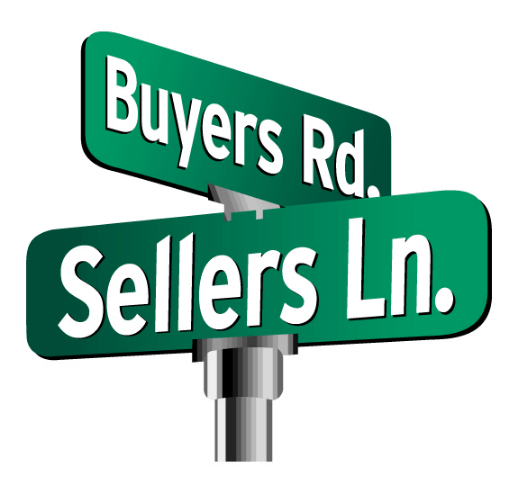 Buyer’s markets can be lots of fun for buyers but not much for sellers and real estate brokers. The best time to buy in Florida is during one of the many frequent buyer’s market’s, when homes and condos are selling at steep discounts of 30% or more and there’s more homes coming on the market every day. A seller’s market is when there are more buyers looking for homes and condos in an area than there are properties for sale. When this happens, sellers can expect to sell their home in less that six months. In a strong seller’s market a nice home may sell within weeks, days or even hours. When there are more buyers than available homes, prices go up. In Florida, it’s not uncommon for demand to far outstrip the supply of homes for sale and push list prices skyward. During a strong seller’s market you may notice fewer for sale signs in the front yard of homes every week. Seller’s markets are not fun for buyers. Prices are high. There is less inventory to chose from. Buyers may feel pressured to buy now because if they don’t prices may even be higher next month. During strong seller’s markets, many buyers may end up paying far more than they want for a home they really don’t like very much, simply because they believe it will be even worse if they don’t act now. Strong Seller’s markets are fun for sellers, real estate agents that can still successfully compete for listings as inventory gets scarce, flippers (investors that buy homes, do no or minimal improvements, then jack up price and put it right back on the market) and new construction builders. Regardless of “where” the market is, becoming a home can be the rewarding feeling knowing that you are stabilizing your family’s future and creating a legacy of building wealth and living the American Dream. We are standing by ready to help you achieve your home dreams! What we found working with many other builders is that they usually have their own lender and then a list of three preferred lenders to choose from if their in-house lender cannot approve them they select from the Alternative List. The problem we see is that list of three alternative lenders all do the same thing and in most cases the same the in house lender? That’s where we come in – we’re different and unique as you see below from most lenders! Our company is a “Direct Seller Servicer” with Fanny, Freddy and Ginny and we service 90% of all our loans which means the customer stays with us and submits their payments to us directly. This allows us to make approvals on “make sense loans” instead or corresponding to another lender and following their guidelines because the loan is being sold to another lender. We have no Overlays – when we pre-approve a Borrower, we follow the agency guidelines exactly to what the Automated Underwriting System approves and tells us. Because we are a direct lender, our pricing is the top 4% of all lenders in our market. We are a true Community Based Lender – which means we offer all the Down Payment Assistance programs for buyers that need them and we even offer own in House DPA program which gives 5% of the sale towards down payment and closing cost as a true gift no lien and no payback on purchase price up to $417,000.00 with a minimum 620 credit score. Additionally, we have a about a 70% conversion rate on “turn downs” from already built homes from the following builders: Lennar, Pulti, Park Square, KB Homes, DR Horton, Snow Construction, Meritage, Minto & Toll Brothers and am very confident we can do the same with your organization. *Please note all percentages and statements are subject to change based on regulations that may arise. The use of hypothetical, predictive, and current statements, by Land Home Financial Services are meant to illustrate current operation standards. NAR reported existing home sales rose 3% in February. Nationally, 5.54 million units sold ending 2 months of declining sales. Housing inventory rose last month but is still down 8.1% from 12 months ago. Housing inventory remains the most influential and persistent factor affecting prices although media and politicians blame speculation, building costs, interest rates, cost of living, and mortgage rules. When the economy is good people want homes. Construction is strong but can’t keep up. Simple rule of supply vs demand is driving home prices. Ready to Choose a Realtor and Buy? A perfect storm of demand, supply and economic factors are making Florida an excellent a great place to buy real estate. See the price projections for the major cities below. The housing market in Tampa, Orlando, Panama City, Sarasota, Naples, Fort Lauderdale, and even Boca Raton are compelling real estate investment value propositions for snowbirds and other buyers in North America. As you’ll see, sunny and warm Florida home prices are quite reasonable. Interest in buying Florida properties from buyers seems to grow and wane through the weeks and months. Although January and February are a lull in demand, the Florida economy is too strong to see that continue. The recent tax changes may discourage speculative investment for a while but buyers are now back. The Florida housing market in 2017 was characterized by a lack of new construction, big price reductions on new condos, a disappearance of South American property buyers, softened house and condo prices, and of course, low taxation rates. If the glut of condo building in Miami is now complete, then we may see upward pressure on condo prices. The variety of homes in Florida is astonishing. From modern 3 bedroom bungalows to condos in towering buildings to quaint beach houses to spacious multi-million dollar mansions, you can have your dream life, walk the beaches, shop for hours, and never have to shovel snow. For a lot of buyers, that’s a compelling value proposition. With more baby boomers hoping to retire somewhere nice, and who have been holding onto their old home because they have nowhere to go, will find Florida a compelling value proposition in real estate investment. Can you afford to live in the region or neighborhoods you have targeted? Which cities and neighborhoods are safe and pleasant to live in? Summers are hot and humid. Can you take the heat and the indoor life? Do you like golf, fishing, walking the beach, boating, and water sports? How well can you run your business from Florida and how much back and forth travel will you need to do? What is the actual cost of living? How much will your mortgage payments be for the next 10 years? Is there a true demand for your area of work/profession? Some people love Florida and some don’t like it at all. If you could live there during the winter only, as many snowbirds from New York, Toronto, Montreal, Boston, Philadelphia, Chicago, and Washington do, it’s might be a no brainer. All you’d have to focus on is finding a home and getting it at a bearable price. With the Florida economy rolling along nicely, there’s no reason to believe there is a downside to buying property in the Sunshine State. And sunshine is a key benefit for most buyers here. Interest in Orlando and Tampa real estate has been particularly strong and that’s likely due to the lower prices. Even homes in Boca Raton and Fort Lauderdale are half the price as those in Miami. However the economies in Tampa and Orlando are holding their own and drawing in new residents due to lower than expected prices on condos and homes. U.S. home values expand and contract. Every year around the Thanksgiving holiday, the Federal Housing Finance Authority (FHFA) publishes their third quarter House Price Index (HPI) reportThis report includes estimates for the increase to the U.S. median home value over the last four quarters (usually Q3 to Q3). Essentially, the FHFA measures the amount U.S. homes have appreciated over the past 12-month period. The 2018 loan limit increase provides an expansion to your conforming loan amount potential. In other words, the 2018 loan limit increase allows Lenders to lend more money to qualified buyers within the conforming classification. Buying a home is like competing in a mud run, naked while planning a wedding at the same time. It’s taxing, it will make you feel vulnerable, it has its ups-and-downs, and it isn’t always fair. But – for those willing to take the plunge, bare their financial assets, and compete for their own backyard – home ownership is one of the most rewarding financial achievements of a lifetime. When buying a home: Tip 1 – Select a qualified, knowledgeable loan officer and develop a down payment savings plan. *Myth 1 – Only low-income individuals can qualify for down payment assistance programs. Down payment assistance programs are for a variety of individuals who meet various qualifying standards. These programs are designed to make homeownership possible for all who meet the qualifications and are able and willing to try. Credit Scores – What should my credit score be to buy a home? When applying for a home loan, your credit score has a direct effect on the interest rate of your loan. Generally, the lower your credit score the higher your interest rate; the higher your credit score the lower your interest rate. While you don’t need a high credit score to purchase a home, generally a higher score will help keeps your mortgage costs lower than if you were to have a lower score. Buying a Home: Tip 2 – Check your credit report monthly and look for any errors or possible enhancement opportunities. Pre-Qualified vs. Pre-Approved – What’s the difference and which is better? Most mortgage lenders offer prospective homebuyers two different options when it comes to their commitment to lend – a Pre-Qualification letter and a Pre-Approval letter. A Pre-Qualification letter is simply a document stating you have submitted the necessary financial documentation (usually the last two years of W2s/Tax Returns, recent Bank Statements, and your Driver’s License) for review and you “qualify” for the requested loan amount. The pre-qualified amount is based on the customer’s perceived debt-to-income ratio (DTI), their financial assets, and credit score. In a competitive home buying market, as we are in today, home sellers want to see a Pre-Approval letter before accepting an offer on their home. The reason is that a lender’s Pre-Approval letter is basically one step away from a full fledge loan commitment and usually translates into a quick and straightforward closing process. Buying a Home: Tip 3 – Get Pre-Approved! A qualified, knowledgeable Loan Officer assisting you to select the best loan package for your situation. Many factors go into the cost of your loan and poor choices up front can cost you a lot in the long run. Real Estate Agents – Do I really need one to buy a home? A qualified, experienced and reliable Real Estate Agent can often be the difference between getting your dream home or not. However, we will be the first to tell you – not all Real Estate Agents are created equal. Do your homework, and interview at least three different Real Estate Agents before selecting one. Often, Loan Officers will have plenty of Real Estate Agent references they can share with you. Buying a Home: Tip 4 – Select your desired neighborhood and hire a qualified Realtor/Real Estate Agent. A Realtor has the full backing of the National Association of Realtors. and working with a Realtor provides the customer the security of knowing the agent they have chosen, answers to a National Association in terms of ethics, educational standards, and legal backing. Mortgage Interest Rates – Will rates go up in 2018? “What’s the rate today?” is every lender’s favorite question – NOT! Why? Well… there’s no simple, straight-forward answer to the question. As mentioned before, many different factors affect mortgage interest rates. For informational purposes, most experts are predicting an increase in the base rate for a conventional 30-year fixed mortgage. This isn’t surprising given the historic lows mortgage rates experienced in 2015 and 2016. Again, while many factors affect mortgage interest rates, according to the Mortgage Bankers Association (MBA), the baseline rate for a 30-year fixed conventional mortgage is expected to increase to 4.6 percent in 2018, 5.0 percent in 2019 and 5.3 percent in 2020. Buying a House: Tip 5 – Develop a sense of urgency to achieve your home ownership goals. It is getting easier than ever to qualify for a mortgage which is due to several factors: Mortgage Lenders have begun accepting lower down payments, the debt-to-income ratios (also known as DTI) used to qualify for most mortgages became more forgiving last year and future home prices are expected to level off. Best of luck and happy house hunting! *Please note all pricing, percentages, and fees are subject to change and are based on personal circumstances. The use of hypothetical, predictive, and forecast statements, by Land Home Financial Services and noted third parties, is meant to illustrate possible outcomes and is not intended to be a statement of facts nor an endorsement of validity. Our staff gets hands-on with charities, non-profits and organizations to enact positive change and create strong, vibrant communities. Specializing in VA Loans for more than 30 years and a VA Automatic Lender. We retain close to 90% of the loans we originate, currently serving over $5 billion in residential loans so you don’t have to deal with a third-party. Our Florida loan officers are currently operating within 10 branches located in Orlando, Kissimmee, Tampa, Sarasota, Spring Hill, Cape Coral, Punta Gorda, Boca Raton, Jupiter and Boynton Beach. We are licensed in 50 states, including the District of Columbia. Land Home Orlando understands that marketing is essential ingredient, so we’ve designed a package of Realtor Partner Benefits created to assist our Realtor’s success. We know the real estate industry and the challenges you face and how to help overcome these obstacles. Land Home has developed a wide variety of co-marketing materials to sell listings while generating new ones. We provide our Realtor Partners a comprehensive list of materials and marketing services. From Start to finish we are able to support the needs of our realtors with our Realtor Toolbox including: Open House Flyers, Call Center Campaigns, Loan Programs Flyers, Email Marketing, Door Hangers, Lead Generation Postcards, Postcard Mailings (listings & sold homes), Homebuyer Seminar Presentations & Home Buying Tips. The concept of a reverse mortgage is perhaps a bit counterintuitive. It can come with misconceptions–most founded by inaccurate information. Is a Reverse Mortgage for you? That’s really a question for your loan officer prior to counseling or the HUD counselor. We hope to shed a little light into the process and give you an idea about the benefits that can come with a Reverse Mortgage. A Reverse Mortgage turns a homeowner’s equity into cash without the need to refinance the property or obtain a conventional home equity line of credit (HELOC). A HELOC is a line of credit that uses the home as collateral and if used, requires monthly payments the homeowners must make. Similar but different, is a cash out refinance. In a cash-out refinance, homeowners can refinance an existing mortgage and take out some extra cash and use it in whatever way they wish. Still, in both instances, it’s a new loan with new monthly payments. A HELOC and cash out refinance are loan types for those who are “house rich” but maybe just a bit “cash poor” but can still afford to make monthly payments. A Reverse Mortgage doesn’t require monthly mortgage payments. Typically, the only time a payment is made is when the borrower(s) ultimately leave the property, and the home is no longer the primary residence. They can always choose to make monthly payments of whatever amount they want, a little or a lot, but that is a choice, not a requirement. The funds from a Reverse Mortgage can be accessed through taking a lump sum, a line of credit or monthly payments for as long as the borrower(s) live in the home. The monthly installments can last the life of the loan or for a predetermined number of months, all the borrower’s choice. FHA also allows a combination of all 3, line of credit, lump sum, and monthly payments. The last 2 requirements were added in 2015; borrowers must be able to keep their property taxes paid and the collateral insured as well as show responsible credit history. If that seems questionable, there is an option to establish a lifetime set aside (LESA) to ensure those charges are paid and the consumer is protected. Lenders will review the borrower’s monthly required obligations and compare that with the amount of disposable income as well as make certain the Reverse Mortgage is a sustainable solution. Unlike regular mortgages, there is no “debt to income” requirement with a Reverse Mortgage, so it is substantially easier to qualify. If there is an existing mortgage on the property, proceeds from the reverse are used to pay off the mortgage and eliminate existing monthly mortgage payments. Reverse Mortgage loan amounts will vary based upon the age of the youngest borrower on the application. Generally speaking, the older the borrower, the more money can be issued. The property will also be appraised just like with any other FHA mortgage. The age of the borrower(s) and the amount of equity in the property are the two main line items a reverse lender will evaluate per a formula set down by the FHA. Visit our Reverse Mortgage calculator to get a rough idea of how much you will qualify for. The most compelling reason to get a Reverse Mortgage is to turn equity into tax-free cash while still living in the property. Interest accrues on disbursed funds and is directly tied to an index, such as a 1 Year or Monthly London Interbank Offered Rate (LIBOR), plus a margin (typically 2-3%) and is only paid at a maturity event a.k.a. the sale of the property or six months after the homeowners leave the home. And, the proceeds are tax-free! Yet, please remember you still have to pay property taxes and keep your home insured. A Reverse Mortgage doesn’t “sell” the property to the lender. The homeowners remain on the title and still own the home. A reverse gets rid of an existing mortgage, therefore eliminating monthly mortgage payments. Heirs are not held liable to pay off the full reverse loan balance should the payoff exceed the value of the home and any remaining equity will flow to the heirs just like any other mortgage. There really aren’t too many negatives with a reverse but there are some considerations. The value of the inheritance can fall as the reverse needs to be paid off and loan fees may be a bit higher compared to a regular mortgage. Some lenders will cover some or all of those fees, and those that are not paid by the lender are deducted at the closing table. When accessing home equity, it’s important to understand all the financial consequences, and these consequences will be reviewed during counseling, but it may also make sense to speak with your financial adviser to make sure you understand the impact a Reverse Mortgage can have on your estate. Overall, a Reverse Mortgage is a great option used to access your home equity without having to sell your home, and without any monthly mortgage payments. If you’re curious or know someone who this might benefit, it’s time to call a Reverse Mortgage lender today. And remember, like a friendly movie review from your sister, all opinions are valuable, they just might not be the most accurate or applicable. In other words, see that movie you think you might like, or in this case, look into a reverse, it just might be what you are looking for. *The above advertisement has not been approved or endorsed by FHA or any other government agency. *Please note all pricing, percentages and fees are subject to change and are based on personal circumstances. The use of hypothetical statements are meant to illustrate possible outcomes and are not intended to be a statement of facts.